Me! Me! Call on me! 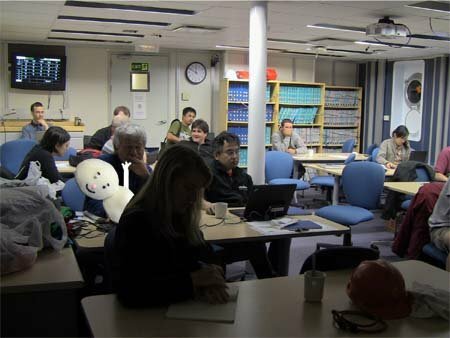 The scientists held a meeting at midnight to discuss the data that was collected from the cores at drill site 1. One scientist from each group stood up and presented what the group has found. The scientists asked each other questions as they tried to interpret the many graphs and charts that appeared on the screen at the front of the conference room. Many questions remain as to what the data means. We will now move to the next site and collect samples. These will be compared to those from site 1 and another meeting will be held. The photos below show some of the many scientists at work in the labs.